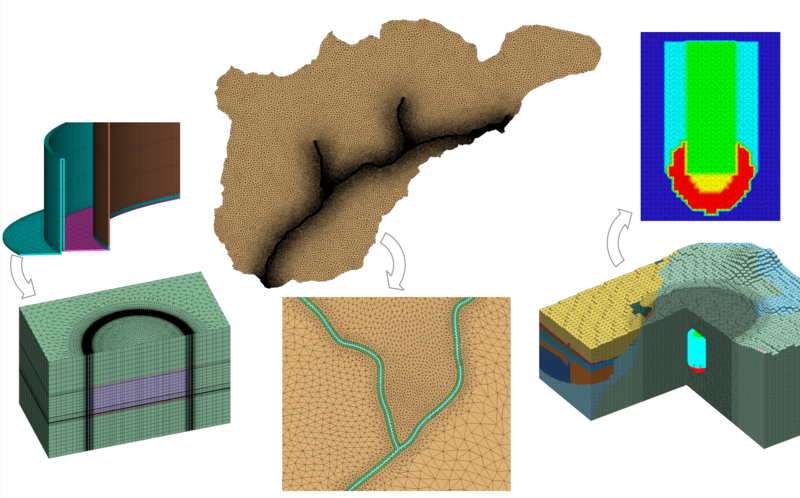 LaGriT (Los Alamos Grid Toolbox) is a library of user callable tools that provide mesh generation, mesh optimization and dynamic mesh maintenance in two and three dimensions. LaGriT is used for a variety of geology and geophysics modeling applications including porous flow and transport model construction, finite element modeling of stress/strain in crustal fault systems, seismology, discrete fracture networks, asteroids and hydrothermal systems. 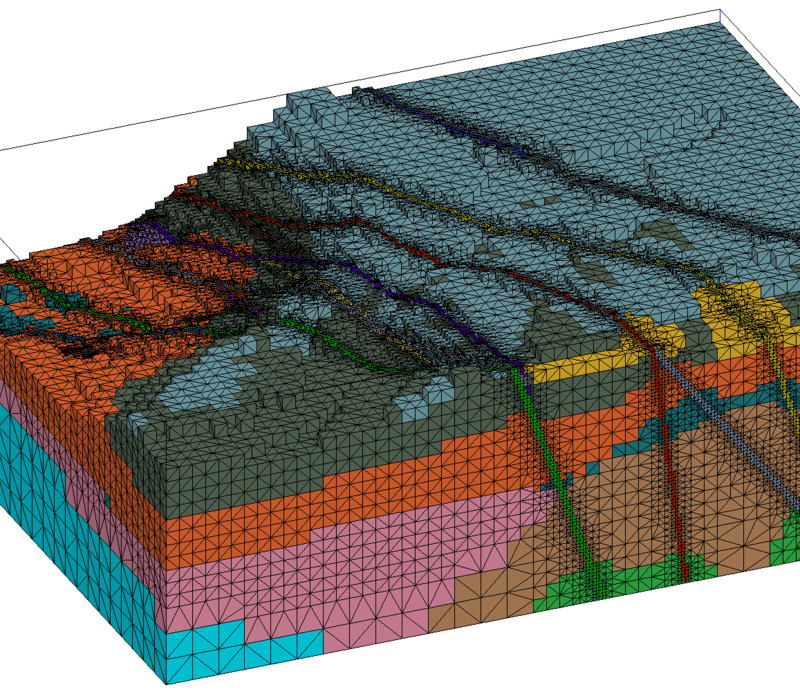 The general capabilities of LaGriT can also be used outside of earth science applications and applied to nearly any system that requires a grid/mesh and initial and boundary conditions, setting of material properties and other model setup functions. It can also be use as a tool to pre- and post-process and analyze vertex and mesh based data. A discrete fracture network composed of hundreds of stochastically generated planar polygons that represent fractures. A variable resolution conforming Delaunay triangulation is shown in black overlaid on each fracture. The meshing is performed using LaGriT as part of the dfnWorks software package. Figure showing features captured for three mesh examples. 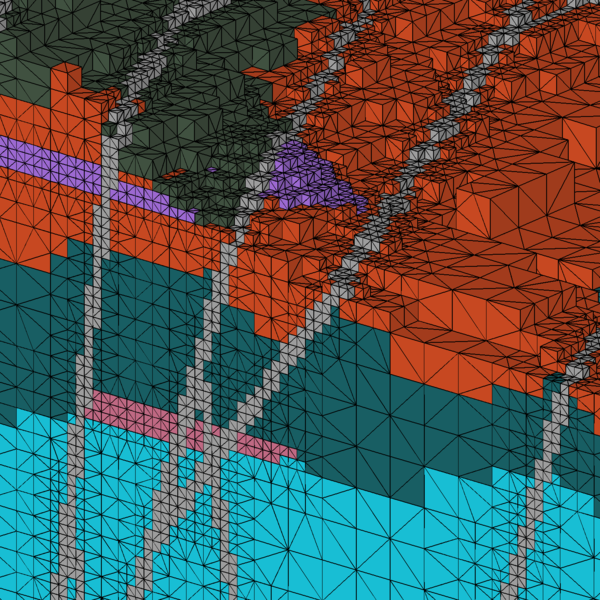 Tetrahedral mesh showing hydrostratigraphic units with refined faults. 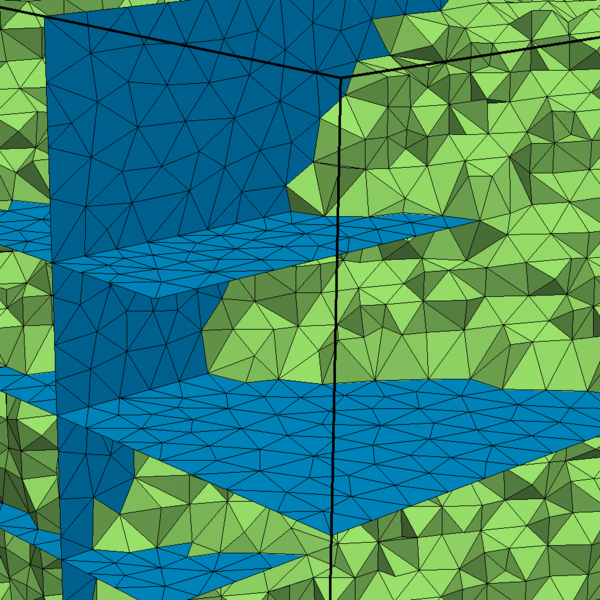 The mesh starts as a regular spaced hex mesh and is octree refined based on faults and units. The octree mesh is converted to tetrahedral mesh as the final step. Register as an LaGriT user here. LaGriT software is open source available under the BSD-3 license. The PyLaGriT module allows LaGriT commands to be accessed interactively and in batch mode from Python. Common and useful meshing workflows are combined into a set of higer level python calls which also enables loops and better parameter control. Voronoi is a parallel and scalable program for writing Voronoi tessellation control volumes (connectivity graph, control volume areas/volumes) compatible with: FEHM, PFLOTRAN, TOUGH2, and HDF5. GRIDDER: is rectangular grid generator that creates structured grids in a format used by FEHM. 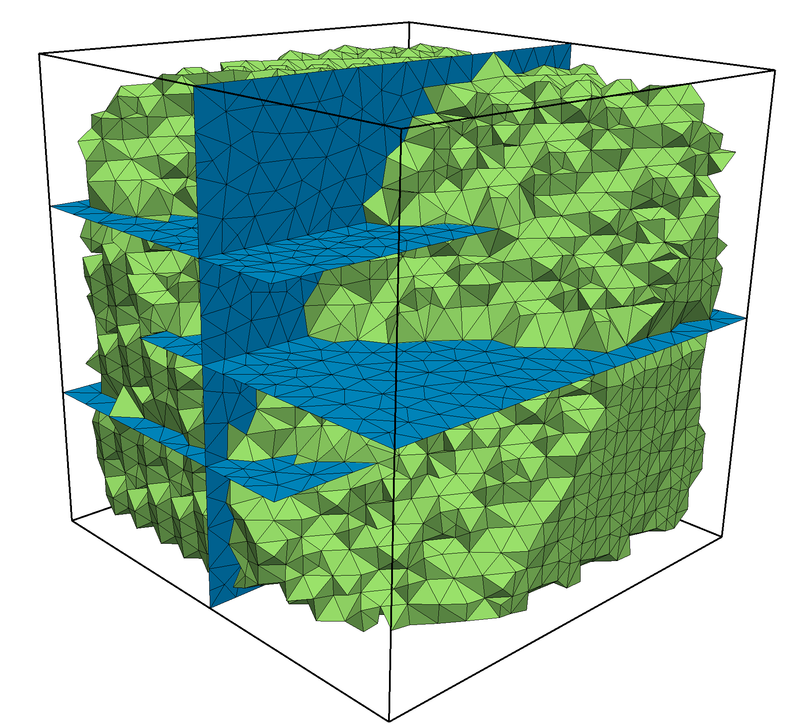 dfnWorks is a parallelized computational suite to generate three-dimensional discrete fracture networks (DFN) and simulate flow and transport. dfnWorks creates high-fidelity three-dimensional networks dfnGen, which combine FRAM (the feature rejection algorithm for meshing) methodology to stochastically generate three-dimensional DFNs with the LaGriT meshing toolbox to create a high-quality computational mesh representation. TINerator takes advantage of LaGriT mesh commands combined with GIS data to triangulate and stack a 3D mesh. Gallery of selected meshing project images. Copyright © 2016. Triad National Security, LLC. THIS SOFTWARE IS PROVIDED BY TRIAD NATIONAL SECURITY, LLC AND CONTRIBUTORS "AS IS" AND ANY EXPRESS OR IMPLIED WARRANTIES, INCLUDING, BUT NOT LIMITED TO, THE IMPLIED WARRANTIES OF MERCHANTABILITY AND FITNESS FOR A PARTICULAR PURPOSE ARE DISCLAIMED. IN NO EVENT SHALL TRIAD NATIONAL SECURITY, LLC OR CONTRIBUTORS BE LIABLE FOR ANY DIRECT, INDIRECT, INCIDENTAL, SPECIAL, EXEMPLARY, OR CONSEQUENTIAL DAMAGES (INCLUDING, BUT NOT LIMITED TO, PROCUREMENT OF SUBSTITUTE GOODS OR SERVICES; LOSS OF USE, DATA, OR PROFITS; OR BUSINESS INTERRUPTION) HOWEVER CAUSED AND ON ANY THEORY OF LIABILITY, WHETHER IN CONTRACT, STRICT LIABILITY, OR TORT (INCLUDING NEGLIGENCE OR OTHERWISE) ARISING IN ANY WAY OUT OF THE USE OF THIS SOFTWARE, EVEN IF ADVISED OF THE POSSIBILITY OF SUCH DAMAGE.